Video calling is the next best thing to being with someone in person, but too often it can be a frustrating or complicated experience. You shouldn’t have to worry about whether your call will connect, or if your friend is using the same type of device as you are. It’s no wonder that nearly half of us never make video calls on mobile*. Today, we’re releasing Google Duo — a simple 1-to-1 video calling app available for Android and iOS. 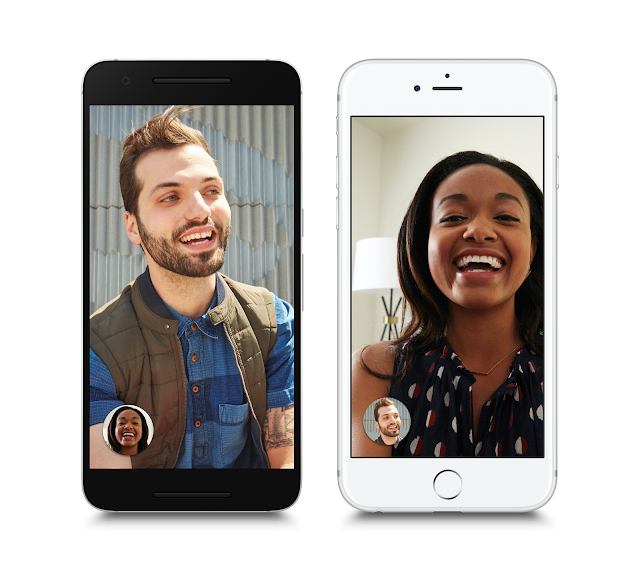 Duo takes the complexity out of video calling, so that you can be together in the moment wherever you are. We all know how it feels when a call fails to connect or when video gets choppy. We’ve built Duo to be fast and reliable, so that video calls connect quickly and work well even on slower networks. Call quality adjusts to changing network conditions to keep you connected — when bandwidth is limited, Duo will gracefully reduce the resolution to keep the call going smoothly. For video calls on the go, Duo will switch between Wi-Fi and cellular data automatically without dropping your call. You can start your call at home, and continue seamlessly even when you head out the door. We designed Duo to feel warm and inviting, focused on just you and the person you’re calling. To make calls feel more like an invitation rather than an interruption, we created a feature in Duo called Knock Knock which lets you see live video of your caller before you answer, giving you a sense of what they’re up to and why they want to chat. Knock Knock makes video calling more spontaneous and welcoming, helping you connect with the person before you even pick up. Finally, we built Duo with an emphasis on privacy and security, and all Duo calls are end-to-end encrypted. Give your friends a wave with Duo! We’re beginning to roll out Duo for Android and iOStoday, and it will be live worldwide in the next few days. A shop with your all shopping needs.